23.5 X 23.5″ $85.00 with $10.00 shipping. SOLD JUNE 2, 2012. 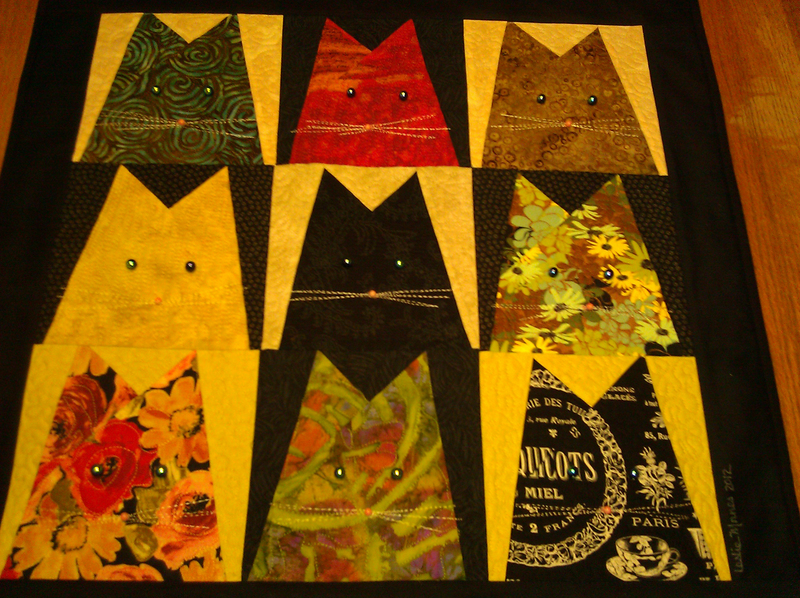 Paris Cats is one of my newest quilts in the cat series. It is my original design and one of a kind. Completed Jan 24, 2012. This wall hanging would look great in your family room, bedroom, office…you name it! It is whimsical but very sophisticated at the same time. None of my quilts are cutesie. 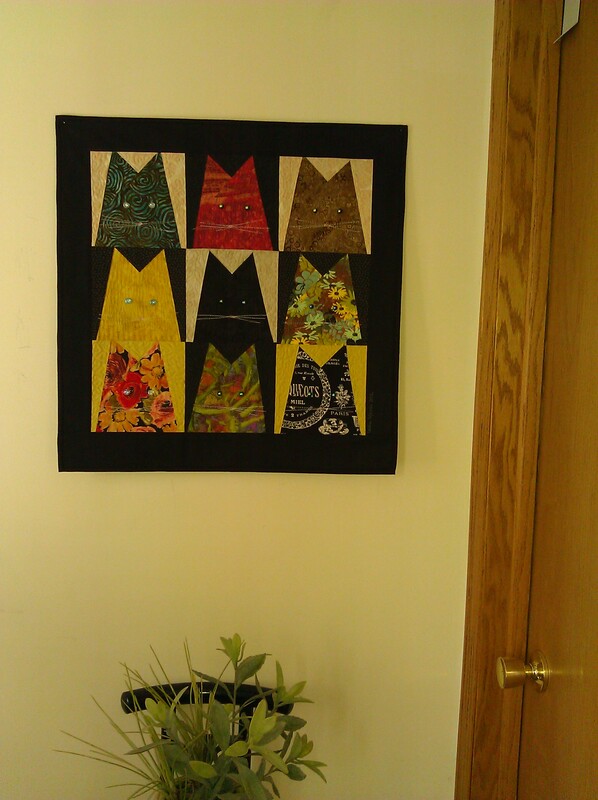 I do all of the piecing and quilting on my Bernina and the stitches that I use vary based on each individual cat. I try to quilt around the design when possible. Hopefully you can see how small my stitching designs are. These are time consuming, but I love the way it looks. A few of the photos were taken before I decided to add the jasper bead noses. The colors are red, turquoise, yellow, brown, black and a soft green. 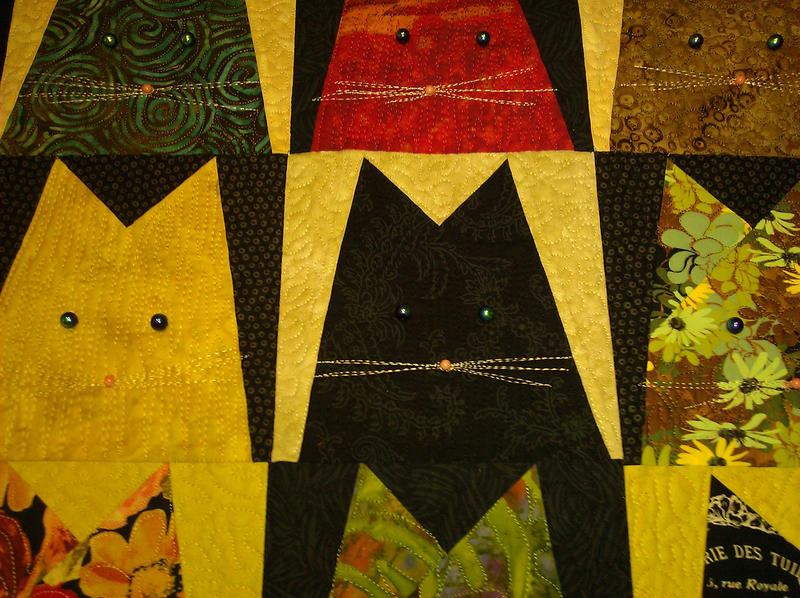 9 Cats made from 9 different fabrics. 4 fabrics are batiks, 2 designer florals, Mr. Paris Cat is made from the only fat quarter of beautiful black and white fabric with Parisian designs that I have. 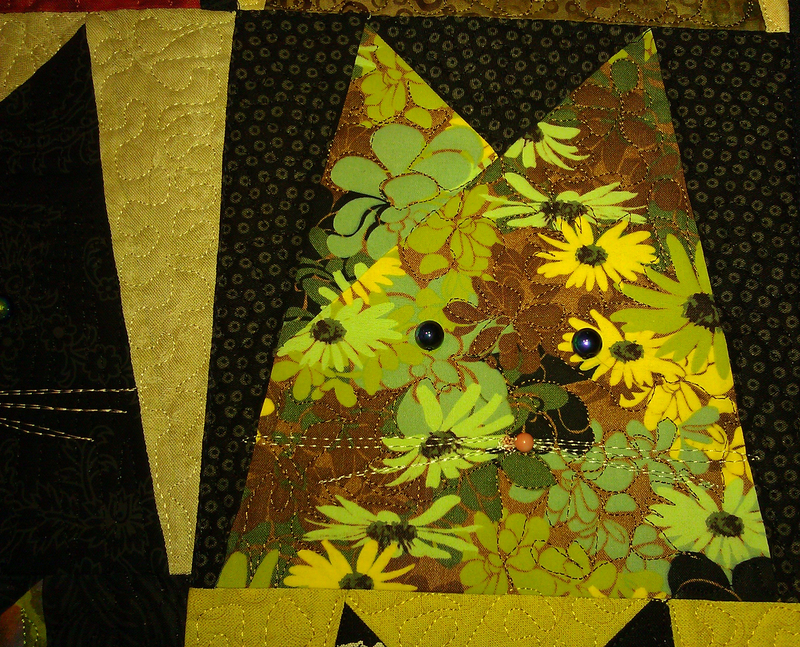 The black cat in the center is made from a beautiful floral tonal print. I have used glass eyes that really shine. I have added jasper bead noses as a finishing touch. This quilt comes with a simple hanging tool that I have created. It is simple and easy to use, and will be virtually unseen when it is used to hang your quilt on your wall. The only holes in your wall will be created by using two straight pins.